Welcome to BC Wine 101, where I will focus in on a different wine region in each episode* for anyone who is interested in learning about BC wine, including the wine bloggers who will be traveling to Penticton for the Wine Bloggers Conference coming up in June. The Naramata Bench was recognized early on in the modern-era of the BC wine industry as a premium growing location in the Okanagan because of many factors, the most significant of which is the proximity of Okanagan Lake. 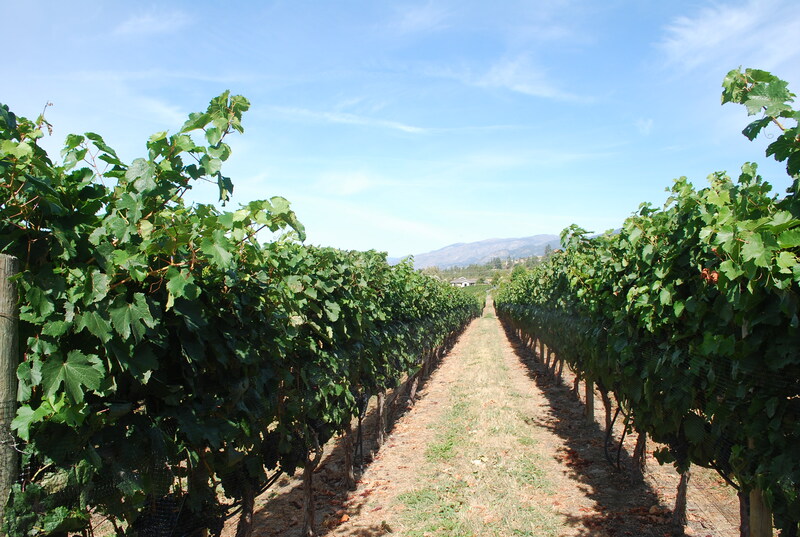 The lake acts as a moderator of temperature that protects the vineyards from both frost and searing heat and allows many vineyards to confidently plant grape varieties such as Cabernet Sauvignon and Syrah that would otherwise be extremely difficult at this latitude. The Bench is the wine tourist’s dream. 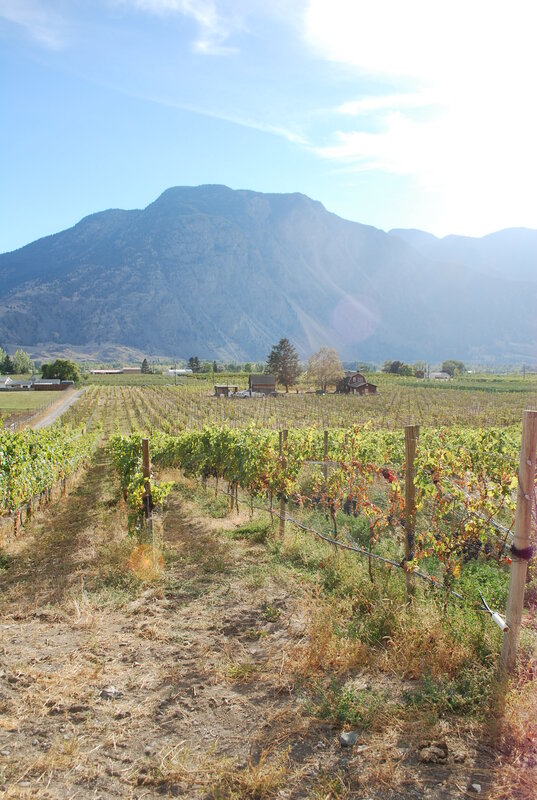 There are so many small wineries in a relatively small area high on a bench of land that is so close to Penticton that locals can conveniently shop for their wines there. Some wineries are easily accessible by bicycle. There is a huge diversity of wineries here that are located close together so that driving times between them is the shortest of any wine region in BC. You can visit a lot of wineries in Naramata in a very short time. You will still need multiple days to see them all, if that is your goal. There are wineries that focus almost exclusively on icewine or pinot noir. There are others with large and diverse portfolios that will surely have something for everyone’s taste. There are traditional wineries and there are theme-wineries with creative labels. Some make their own cheese. Some have restaurants or bistros. Some have guest houses or B&B’s. There is a huge diversity, but only one road. That’s another thing that makes Naramata unique. The main (and only) road that will take you to the wineries doesn’t connect with anywhere else. It is a road to nowhere. While other regions are places that you drive through, you can’t do that here. Naramata is the destination, the end of the road in BC wine. Fitting then that this is the final chapter in BC Wine 101. See you at the Wine Bloggers Conference! Late day sunlight gives the vines on Bench more sunlight that other regions in BC. Lang Vineyards Laughing Stock Vineyards Misconduct Wine Co.
Cabernet Sauvignon grows for Kettle Valley Winery within feet of the lake. Part of the 180 degree view from the patio of Bench 1775. *Unfortunately, I was unable to produce a podcast featuring this region. Summerland is a great little town. I say that not because I grew up there (I didn’t), but I did live there for a short time when I first relocated to the Okanagan Valley. There’s an energy here that isn’t like other towns in the valley. The landscape around Summerland is extremely dynamic. There are wide valleys, high mountains, lakeshores, deep canyons, and huge silt bluffs all within town limits. And the most amazing part is that the town is located inside the remains of an extinct volcano. But that’s another story. There are a lot of wineries here and they are all very close together. You can see a lot of terrain and try a lot of wine here on a lot of different patios all with remarkably different views. Straight roads do not happen in Summerland. There are more S-curves and wineries that start with the letter “S” than anywhere else in BC. I’ve always enjoyed my visits to wineries in Summerland and have made the wineries here destinations for over 10 years now. Even living in the south Okanagan as I do, I always enjoy making special trip to Summerland just to visit a particular winery or to track down a particular bottle of wine. It all happens there. Of all the regions covered so far in BC Wine 101, the West Side Wine Trail is the most urban. 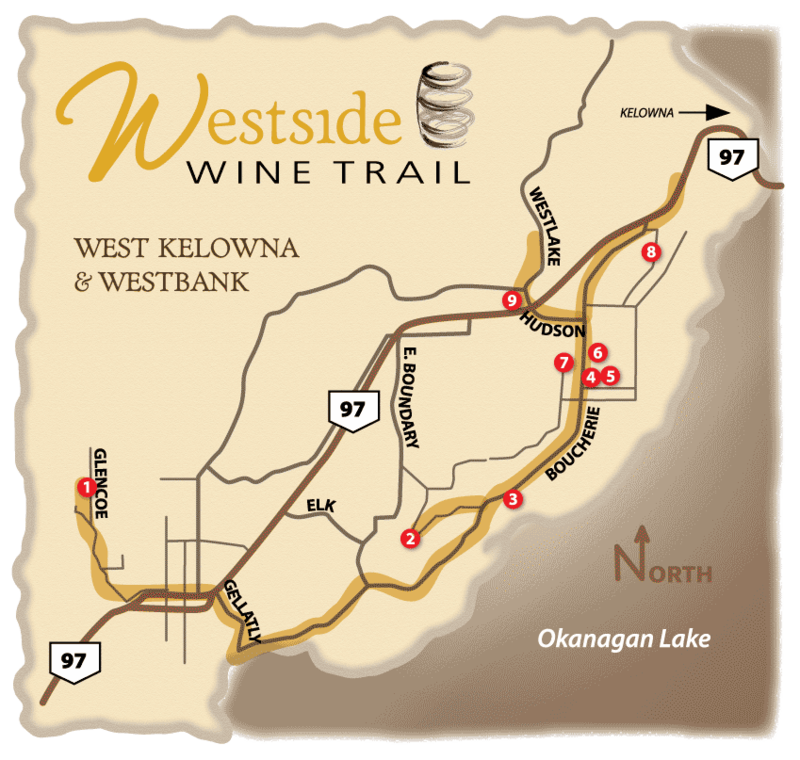 The Trail takes you through areas in West Kelowna where vineyards that have grown for over 50 years are now surrounded on all side by gated housing developments. They are probably the only collection of wineries in BC that are accessible by public transit. But Being this close to Kelowna and the growing communities of West Kelowna has its benefits. The range of wineries here is truly amazing. A 3-minute drive on Mt. Boucherie Road will take you past wineries in garages and quonset huts, mid-sized wineries with modest wine shops, and a huge commercial winery with an architectural grandeur that is unparalleled in BC and probably Canada as well. And according to Tina Slamka in this podcast, all of these wineries have one similar feature that unite them all, regardless of their size. I first explored the area as a wine tourist 10 years ago. I remember going to two very different wineries that day and having a great experience at both of them. 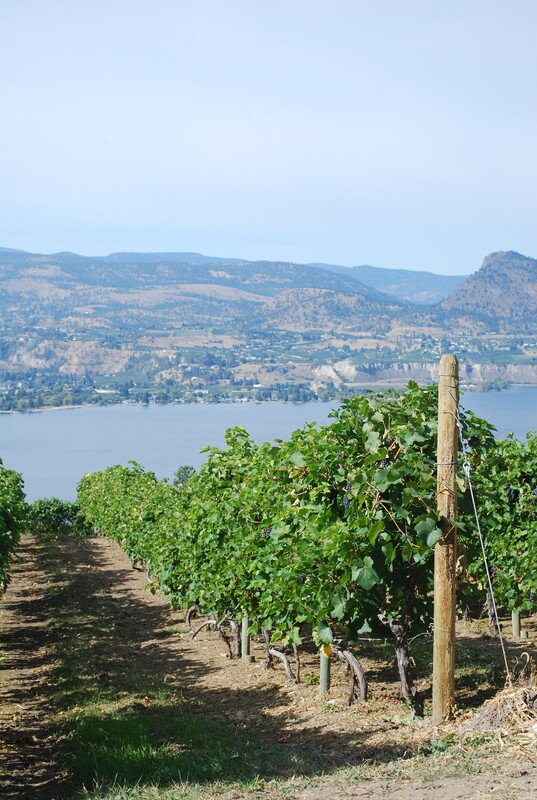 The view of Okanagan Lake is so dominating here, it is impossible to ignore at every winery on the trail because of the slope on which the wineries are perched. I remember taking a lot of photos that day. In this podcast, Tina Slamka Chair of the West Side Wine Trail, co-owner and wine shop manager of Little Straw Vineyards, and Salina Petschulat Curtis, marketing coordinator for the West Side Wine Trail sit down for a chat about what makes the West Side such a welcoming place. Tasting in front of Quail’s Gate Estate Winery. From the Barrel Top Grill at Little Straw Vineyards. Volcanic Hills is across the street, Mt Boucherie and Beaumont Wineries are on the far left. . The Amphitheater at Mission Hill Family Estate Winery. The Terrace Restaurant is on the left. Riverstone Estate Winery, north of the town of Oliver. Looking south from White Lake Road. The Golden Mile is on the right side of the valley, Black Sage Road on the left. Map courtesy of Wine Tripper – BC Edition available on iTunes. A little disclaimer about this region: I live here. Although it’s pretty safe to assume that I will have something personal to disclose about every wine region in this series, the fact is that I live and drive through this area everyday and have for over 5 years now and have worked at wineries here for most of that time. I run into winemakers picking out bananas at the supermarket. My kids go to school with their kids. It’s a community built around wine, farming, and central air-conditioning. The summers here can get very hot. Which is why grapes, and those who grow them, love this region. Some of the best vineyard land in the country is located here. In this podcast, Tim Martinuk, president of the Oliver-Osoyoos Winery Association, talks about what makes this area worthy of the name, the Wine Capital of Canada. The wineries of the Oliver Osoyoos Winery Association and the South Okanagan. Looking north from Burrowing Owl Vineyards on the Black Sage bench. Overlooking the town of Oliver from Hester Creek Estate Winery’s vineyards on the Golden Mile bench. Fall colors in a vineyard near the town of Oliver. Sunset from Nk’Mip Cellars looking northwest over Osoyoos Lake.